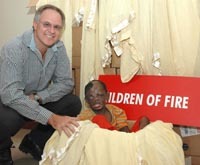 In late November 2004, Children of Fire was the happy recipient of 1000 airline blankets from Emirates Airlines, that will be added to our future Disaster Recovery Bags. 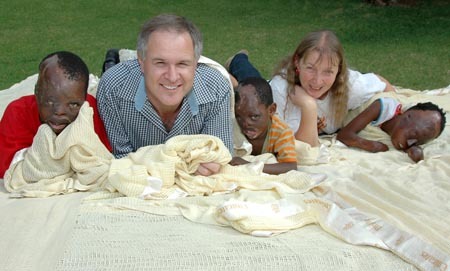 Pictured here are Nsizwa Vilakazi (12); Sicelo Maduna (6); Juan van Rensburg, Emirates Regional Manager Southern Africa; Jon Maiden, Children of Fire Training Manager; and Bronwen Jones, Director Children of Fire. 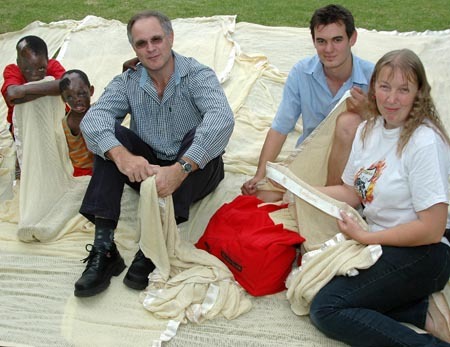 The Disaster Recovery Bags Children of Fire has assisted the survivors of squatter camp fires for years in South Africa, with second hand clothing, food and other domestic necessities. In 2004 we made the process more formal. On Auguat 13th 2004 a fire affected about 27 families (at least 100 people) in 8th Avenue near Vasco da Gama in Alexandra Township, Gauteng Province, after a man left a stove on when he allegedly went to the shebeen. It was also suggested that due to the slow rate of electrification of the township, that those shacks were using illegal electricity that was highly likely to cause a fire. The residents of 8th Avenue were the fortunate recipients of Children of Fire's first Disaster Recovery Bags. These tough red cotton bags were made by a women's co-operative, and the cost borne by staff from the British High Commission in Pretoria. The tins of corned beef and the saucepans were funded by the Cradle Project - an employee volunteer project within Investec; the sugar cane gel stoves were funded by Pick n Pay; Varsa Trusts money went towards safety candle holders and First Aid supplies; AMB Advisory Services contributed towards the wash things; individual donors including Trevor Murugasen; Roshan & Judy Parbhoo, Kuben Rayan; Andy Naidoo helped with crockery, cutlery and non perishable food. When all hope is lost, it lifts people's spirits a lot to be able to cook their own food rather than line up at a soup kitchen or often - to have nothing to eat at all. To be able to light their temporary shelter, to wash their faces and clothes, and to be able to give their children books and pens to take to school the next day. The bags also included a couple of outfits of second hand clothes and at least one pair of shoes. Where young babies are noticed - or even heavily pregnant mothers, more effort is made to give those families extra support. We still seek and sort clean secondhand clothes from the general public but bag contents range from tinned food with tin openers to saucepans, face cloths, soap, buckets, school uniforms, exercise books, text books, reading books and other school stationery and toys as well as school shoes where possible. With sufficient financial donations we purchase sugar cane gel stoves (about R60) and safety candle holders (about R20) as well as fresh bread and other staples. We also recommend a "hot bag" (R65) as a safer way to prepare food in any community as it more than halves the cooking time (saving fuel), and by putting a covered saucepan inside the foil and cloth bag, there is less risk of fire and injury from open flame stoves. In winter we like to include a hot water bottle in the Disaster Recovery Bag as well. Sometimes slightly out of date food is available in an emergency through the Robin Good organisation, but then we need help with transport to collect it from the Randburg area. We hope that hotels and food shops will become more proactive with their assistance. Beyond Gauteng we do not assist with bulk supplies of food and clothes, due to the lack of trained volunteers. Sometimes volunteers are also given clothes and other items in recognition of their assistance. We carry out fire prevention, first aid training and outreach across the country and assist badly burned children throughout the land.